Q: How much is each used golf club worth? Typically, a used golf club or iron set can yield $5.00 - $500.00 or more for your charity. Q: How can I determine the value of a golf club? Go to www.iGolfValueGuide.com and complete a golf club search. Q: Why is my $300 Driver only worth $20.00? The golf club market today is saturated with a constant supply of newer and more advanced equipment. Clubs lose their value very quickly just like any other product in demand like computers, software, phones, etc. There are thousands of old golf clubs that have absolutely no value whatsoever. Good news, iGolf Value Guide offers the highest payout in the industry! 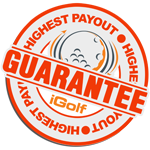 This claim is backed by iGolf Value Guide’s Highest Payout Guarantee. Q: Are all clubs accepted? No, clubs not included in iGolf Value Guide’s online catalog, which features over 3000 different golf clubs, are not valued and therefore not accept. Q: How much money can we expect to raise by conducting a Recycling Golf Club Drive? It is really up to you and your tournament committee’s commitment. Consider the following: Your tournament has 144 golfers and only 100 of them donate, some will donate a $10 wedge and others will donate a $150 Iron Set and so on. So you can see how hard it is to predict an accurate total. Q: When can I expect the payment check to arrive? Coachella Valley based golf events receive payment as soon as donations are received. Charity events elsewhere can expect a check in the mail within 7 days from when we receive your shipment of recycled golf clubs. Q: Are golf club donations tax deductible? Most golf club donations are tax deductible. Please contact our tax professional for more information. Q: What is the value of a damaged golf club in need of repair? Some damaged clubs have no value, others may receive partial value. For more information to click here. Q: Can Golf 4 Charity create a custom fundraising flyer, price? Yes, we can upon request. All we request is your creative input and logo(s). Golf 4 Charity services are FREE. Q: What other tournament tools do you offer?